Property Size : 156 sq.m. If you are dreaming of owning a property where the views of the bright blue sky and sea mingle into infinity, then this could be it. The main entrance of the house leads into the open area of kitchen, dining and living space where you can enjoy the eternal views. 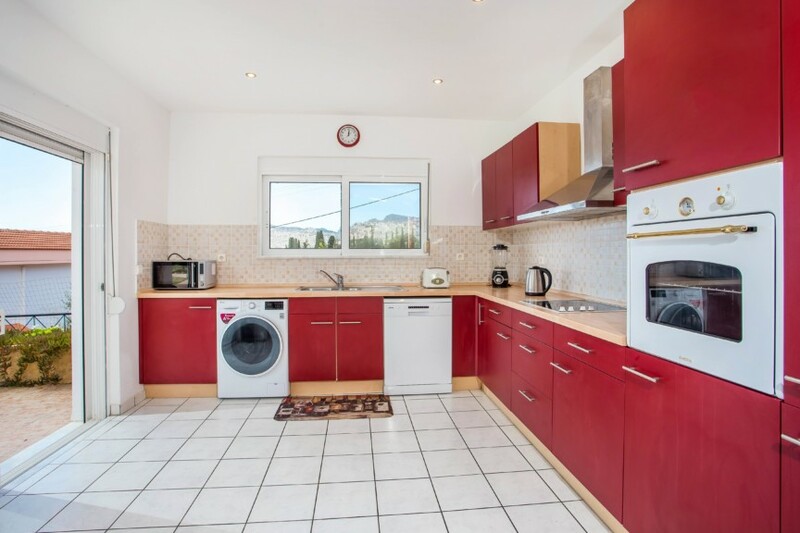 The fitted kitchen is spacious with plenty of cupboard space and includes appliances. Also on this same level is a bedroom and a full bathroom. Upstairs are a further three bedrooms all with fitted wardrobes and balconies where you can continue to soak up the beautiful coastline scenery in front of you. The swimming pool sits surrounded by patio decking, green lawns and various Mediterranean plants. A large patio, accessed from the kitchen is a perfect place to set a table for eating outdoors, day or evening. The lawns are ideal for setting up simple garden games such as bowls, table tennis or ping pong – or simply keep to admire. From the swimming pool are steps down to the lower garden which has been left natural with herbs growing amongst the rocks. An iron gate, wall and fencing encompass the house and land including a car parking space. Here are the inspiring views that we envisage when contemplating Greek island living. Please fill in all the fields below to request more information about Blue Yonder.